Might the Nets try integrating the vertical stars-and-stripes on the left side of their black-and-white uniforms? Paul Lukas of Uni Watch has obtained a rendering of just that, reportedly created by the Nets. You’ll have to click through to see the jersey, but it’s worth it. It looks awesome. There’s just one catch: Lukas says the real version will have sleeves. Ugh (though I think I would take the the tradeoff if forced). Lukas has also obtained a mockup of the soon-to-be Charlotte Hornets home uniform (again click through to see). It’s solid, though just having the purple-and-teal Charlotte Hornets back might be skewing my opinion too positive. I don’t really like the “Hornets” font, and the numbers are too blocky. But the understated style and one-sided vertical stripes are cool. Lastly, Lukas includes one his reader’s really cool designs. Remember when All-Stars used to wear their own teams’ uniforms like this? 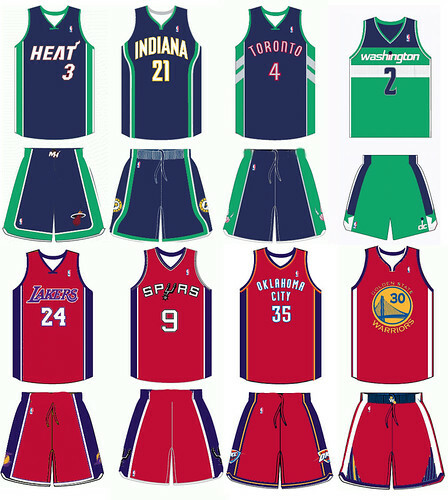 The NBA, wanting to sell All-Star jerseys, won’t go back to that. But the hometown pride in a national contest certainly added something, and I liked the aesthetics. So how about a compromise? All-Stars still wear the colors representing their conference, but the uniform has the logo of their actual team and is stylized for their actual team. Check out the examples here. I think those might even sell better than the current All-Star jerseys.